Crysis is without doubt one of the most visually stunning and hardware challenging games to date. 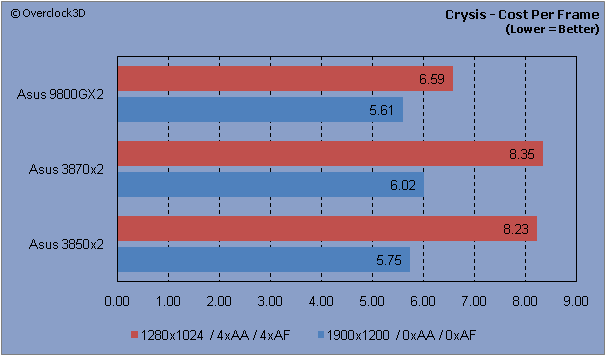 By using CrysisBench - a tool developed independently of Crysis - we performed a total of 5 timedemo benchmarks using a GPU-Intensive pre-recorded demo. To ensure the most accurate results, the highest and lowest benchmarks scores were then removed and an average calculated from the remaining three. 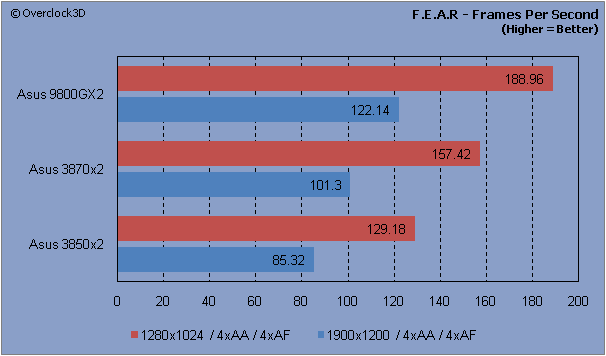 In keeping with the results over the previous page, the 9800GX2 takes the lead in both the FPS and CPF scores. 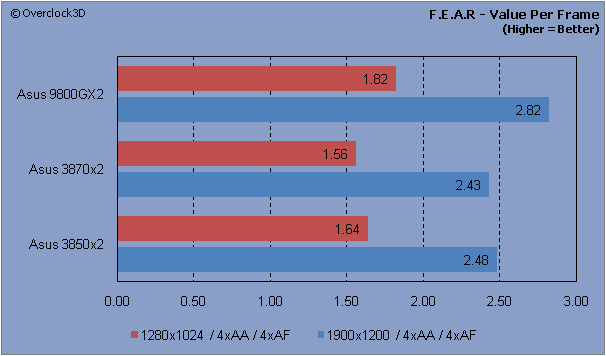 Interestingly there is very little difference in the FPS results of the 3870x2 and 3850x2, giving both cards very similar Value Per Frame scores. 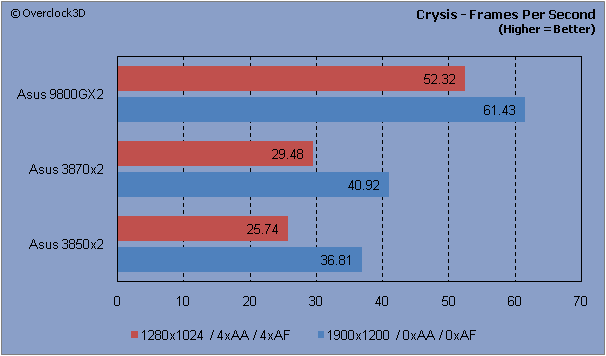 Considering there is less than 5fps difference between both cards, it would certainly seem that the 3850x2 is the more sensible buy for Crysis. F.E.A.R. is a game based on the Lithtech Jupiter EX engine. It has volumetric lighting, soft shadows, parallax mapping and particle effects. All results were recorded using F.R.A.P.S with a total of 5 identical runs through the same area of the game. The highest and lowest results were then removed, with an average being calculated from the remaining 3 results. Anyone see a pattern emerging here? Yes, once again the 9800GX2 is in the lead when it comes down to outright graphical performance, with the 3870x2 and 3850x2 not too far behind in the 1900x1200 results. However, this time round both of the ATI cards show a great performance/value ratio and manage to beat out the 9800GX2 by a significant margin. I`m always keen to see comparisons on a per-cost basis. I think it`s very important for people who intend to build the best pcs they can, with the budget they have available. It`s not merely the case that with limited funds ur going to end up with a crap pc, but more that u have to be wizer about the parts u use for what. Value. Same is to be said for cpus. The only thing about these comparisons is that they can change so quickly. Next week or month, the prices change and the performance per cost changes - and yet u `can` be left with the memory of what the previous review said. I`d like to see a push for a sale based on what grocery supermarkets have for products. There are enough benches about, and as long as all the factors are taken into consideration - maybe at the start of each year, some1 like Futuremark can name a "performance" pc, afa they concerned. Thereafter in the year, the products for sale can have $4.50/frame08 ($3.75/frame08OC) - or something similar attached to them - based on their results within that PC setup. Crazy idea, but it only takes some1 in someplace like Futuremark to mention it at a meeting and we`ll all be seeing it in the ads. Don`t think they necessarily need to take to AMD/nVidia about it, and have their legal people draw up a waterproof disclaimer.